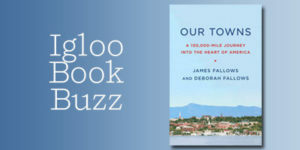 Our new Igloo Book Buzz selection is James and Deborah Fallows’ OUR TOWNS: A 100,000-Mile Journey into the Heart of America, published by Pantheon on May 8. For the last five years, the Fallowses have been traveling across America in a single-engine prop airplane. Visiting dozens of towns, they met hundreds of civic leaders, workers, immigrants, educators, environmentalists, artists, public servants, librarians, business people, city planners, students, and entrepreneurs to take the pulse and understand the prospects of places that usually draw notice only after a disaster or during a political campaign. The America they saw is acutely conscious of its problems—from economic dislocation to the opioid scourge—but it is also crafting solutions, with a practical-minded determination at dramatic odds with the bitter paralysis of national politics. At times of dysfunction on a national level, reform possibilities have often arisen from the local level. The Fallowses describe America in the middle of one of these creative waves. Their view of the country is as complex and contradictory as America itself, but it also reflects the energy, the generosity and compassion, the dreams, and the determination of many who are in the midst of making things better. The Fallowses talked to Slate about OUR TOWNS: “We started this project in 2013,” Deborah said, “when there wasn’t a political backdrop to this story. It was more coming out of the recession, and us coming back from China and wanting to get some instincts about where America was at this point, and wanting to go out to as many places as we could to see if our impressions of what we heard about America from being in China for a long time—everything was going to hell in a hand basket, and that there were really tough times—was true.” James added, “I think we’re naturally optimistic people, and so our starting point was more we kind of didn’t think things could be that bad, and it wasn’t our experience and it certainly wasn’t our experience in the time that we had been in America before. We didn’t have an agenda. It was really to just open the book and see what was out there.” “We didn’t ask about national things,” Deborah said, “except at the very end. But when we just asked about people’s lives and what was going on in their town, it was so heavily weighted towards in my neighborhood, at my schools, on our main street, what people need here, what people want from my town. I don’t know if people had just given up on the national scene or they didn’t want to talk about it anymore, but it felt like it just didn’t occupy a huge part of where their energy and where their intentions were set and were focused.” James concluded, “The complete tribal nature, identity nature, quasi-religious nature of national politics is separate from the local in a way that I don’t know an exact precedent. It is reassuring for the health at the local level. It’s quite alarming that nonetheless, we have this national result. I guess the news we have to offer is that there is that contrast because I think most people have assumed that national-level dysfunction must indicate profound disease through the entire body politic.” To read the full Slate article, click here. 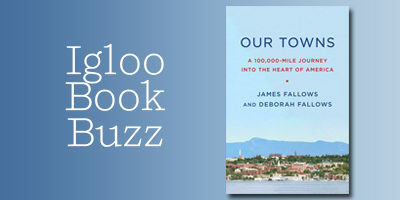 Watch and listen to James and Deborah Fallows’ recent segments on CBS Sunday Morning and CBS This Morning. 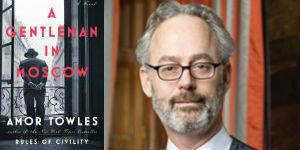 James Fallows has been a national correspondent for The Atlantic for more than thirty-five years, reporting from China, Japan, Southeast Asia, Europe, and across the United States. He is the author of eleven previous books. 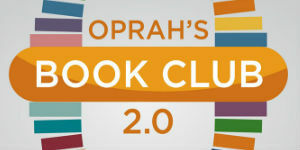 He has won a National Book Award and a National Magazine Award. For two years he was President Jimmy Carter’s chief speechwriter. Deborah Fallows is a linguist and writer who holds a PhD in theoretical linguistics and is the author of two previous books. She has written for The Atlantic, National Geographic, Slate, The New York Times, and The Washington Monthly, and has worked at the Pew Research Center, Oxygen Media, and Georgetown University.